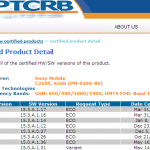 Sony recently crowned Xperia L with android 4.2.2 15.3.A.0.26 firmware update with which Xperia L joined the elite club of Xperia Z series which were already on android 4.2.2 firmware a lot ago. 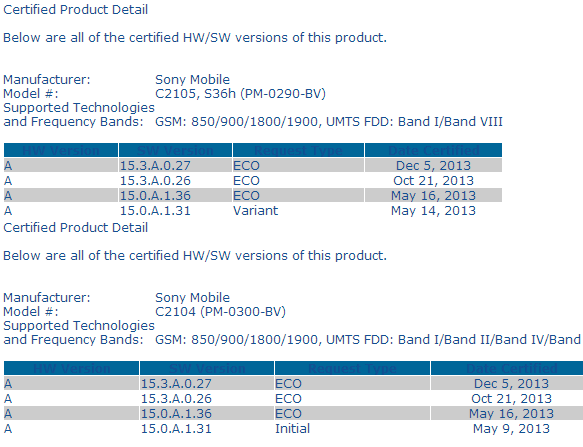 Thought the 15.3.A.0.26 firmware update brought many new features on Xperia L but with it brought some bugs too. 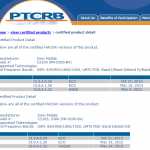 Xperial L 15.3.A.0.27 firmware ( android 4.2.2 ) is recently certified on PTCRB, a minor bug fixing update over previous android 4.2.2 15.3.A.0.26 firmware. 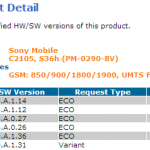 15.3.A.0.27 firmware is spotted for both Xperia L C2105 and C2104. No ETA for the 15.3.A.0.27 firmware update yet. We saw many users who were asking us to post previous firmware builds which clearly states that the current firmware has some serious bugs. 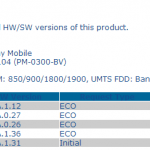 No specific date is there for the release of 15.3.A.0.27 firmware but it should come soon hopefully, a delightful news for all Xperia L owners. 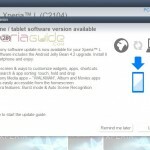 Sony has recently exposed its plans for android 4.3 update and android 4.4 update. It is very much clear not that android 4.3 will not come to Xperia L but it should be in the second batch of devices getting android 4.4 update next year. 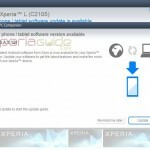 Let us know Xperia L users what bugs you are currently facing on android 4.2.2 15.3.A.0.26 firmware, drop your comments below. – when scrolling images in album, the topmost portion of screen responds slowly. it looks like imges are tearing there. – when we click on transfer data to sd card, then it says Unfortunately Settings has stopped. – when we open any image from album widget, it says Unfortunately Xperia Home has stopped. – sometimes media sound is routed to the ear speaker. all media sounds come from the front speaker instead of loudspeaker. it can damage the ear speaker. – sometimes phone reboots automatically when earphone is connected. 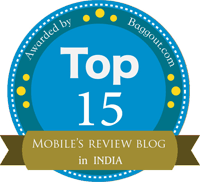 I am agree with u. I am facing same problem with my phone. The left 10 pixel (maybe10) is late when sliding. 2 times its’ used the front speaker not the back one. 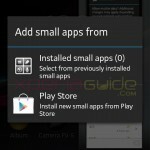 Serious bug from the update to android 4.2.2. I am also facing all the bugs mentioned above, plus i also have a problem with the folders i.e after creating folders, if i restart my phone then most of the apps come out of the folder, and the folder becomes empty :(. you can solve this problem by software repair option in pc companion. i had also this problem, but i repaired and its fine now. first backup your data on internal storage, because all data will be lost in repair. open pc companion, go to support Zone, click on software repair. it will reinstall the software. you need an internet connection for this. All the above bug in addition if I add multiple recipient in message contact list it shows error “Invalid number(s):[and 1 more]”, Some recipient(s) will not receive the message with the invalid number(s). Send anyway?” with No, Yes button. Shortcuts of app. stored in internal memory dissapear after I switch my phone off and on. read my above comments. I had also this but I fixed it. No, I have allready done factory reset and nothing changed. In support forum many users wrote the same issue and nothing helped, reseting, repairing, nothing. I expected that it should be repaired with this new firmware. This will be fixed in next software update. Unfortunately I don’t have any timings for the next software release at the moment. Don’t forget to mark posts that answers the topic as Accepted Solution. 1 – The camera on the lock screen does not work. 2 – When I press the button on/off (with the cell lysate, only with the screen off) the screen not connecting, have to be pressing the button repeatedly to turn on the screen. It would be great if Sony also put an option to restart the phone, it would be splendid. Support OTG cables would be great. It’s a shame the Xperia L have not supported OTB cable! your folder is your album.. keep different photos in different folders.. your folder will be shown as different albums in album app.. The Walkman is catching sharply, with various lags and bugs on the lock screen. This update is horrible! iam faceing lots of problem….these problem given below…..
1.camera flash problem…flash and shutter timeing problem… picture quality is not gd..